On the one hand, Steve Edwards Breaking Into the Backcountry is a memoir: Edwards invites the reader to remember with him what it was to live on ninety-two acres of natural solitude along the Rogue National Wild and Scenic River in southwestern Oregon. On the other, Breaking is a meditation: Edwards turns inward, inviting the reader not to simply sit with the river, the Klamath Mountains, the pines, the black bear, deer, and slugs, but to make meaning of the wild. And if you’ll grant me yet a third hand, Edwards’ book is a purpose-filled reflection. It’s a return to what was before in an effort to make sense of what is after. This is not to say the book is sometimes one thing and sometimes another. In fact, what Edwards does well, and what I find rather satisfying, is that Breaking is often the chorus of memoir, meditation, reflection. He offers the reader a chance to see, to really remember, the wild around the Rogue. He then fastens a kind of mattering, a reason, for the seeming indifference of the natural world surrounding his small cabin. It’s a mattering, Edwards reflects, that he now can carry internally. Edwards move is near opposite of my own. I left my home, the Pacific Northwest, for the Midwest, for Chicago and then Indiana. After winning a writing residency, Edwards left his home, Indiana, for the Northwest. Of course he left quite a bit more. The residency required him to play the role of caretaker on a homestead more than two hours from the nearest tiny town. If only for a spell, he left nearly everything. And he spent more than a good deal of time alone, in deep and troubling solitude as he often describes it. But it’s a solitude that makes the book worth reading. The solitude Edwards experiences becomes just as much a character in his story as the deer that eat from his apple tree (one of them lovingly named Cougar-Bait), the McDonald’s drive-through clerk he sees on trips to town, the authors he reads, and the visitors who come either because they miss him or are checking to see he’s keeping proper care of the homestead. The solitude seems to speak to Edwards, and so to us readers, through lines of poetry he encounters and the mice he kills. It also speaks quite a bit of fear. The solitude Edwards’ experience is present as he is asked to deal with the death a grandparent, the struggle of a friend’s pregnancy, the still-present pain of a divorce, and the ineffable events of 9/11. So while this is a book about the wild, about the Rouge River and living with oneself apart form conventional convince in the natural world, it’s more often concerned with relationships. Edwards remembers, meditates, and reflects on his relationship with solitude, with his father, his friends, and his fear. These relationships often give way to some lovely nature writing. They certainly give way to honest, relatable, even funny notions of fear. At times, Edwards teases out relationships where, as a reader, I’m would rather see none. As a yoga teacher I know points out, standing before a mountain does not have to be translated into commentary on our lives. It can just be a mountain. Edwards writes most everything as commentary on his own life. Then again, we are guests in his backcountry, and he is showing us what he sees out here. 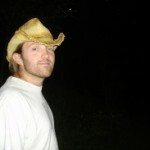 Jeremy Cushman lives in Lafayette, IN and is a PhD student in Purdue’s Rhetoric and Composition Program.